LadioCast Version 0.12.6 has been released on MAS. Updated for microphone usage description. 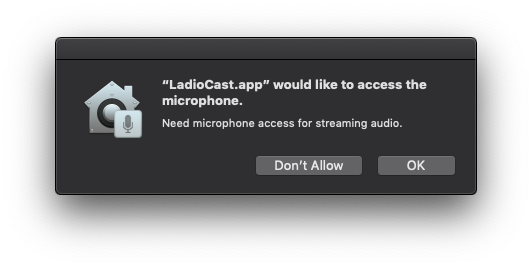 Mojave’s privacy database daemon (tccd) logged errors and failed to open dialog box to allow microphone (actually all audio inputs) access when the app lacked NSMicrophoneUsageDescription (“Privacy – Microphone Usage Description” on Xcode) in Info.plist, even if it had com.apple.security.device.microphone (“Capabilities” – “Hardware: Microphone” on Xcode) in its entitlements. Fixing that is only the reason of this release. I second the request for doing VST insertion. I’ve got some external processors to which I’d love to route my audio prior to broadcast. I’d like to route a selected input to a VST plug-in, then have a selected output draw its input from the output of that VST. Thanks for a great too, even as-is! Thank you for your suggestion on ladiocast! 1. Thank You for update app! 2. Please make ability to launch several (up to 4) instances of LadioCast. Because the shift to Mojave now are almost complete for most users (more than 85%), You able to make this update without suffering possible uncompatibility with Mojave. Most amateur (and of coarse PRO) Mac-based online radio stations already have more than 1 channels (for example jazz + country music, or classical + jazz music, etc.) and with LadioCast we able to be happy. Thank You for future support and customer care! Thank you for the information and suggestions! Any news about this? Thank You! LadioCast Version 0.12.5 has been released on MAS. Support for dark mode on macOS Mojave. I noticed that macOS Mojave’s new privacy database needs more description about the app’s usage of microphone. 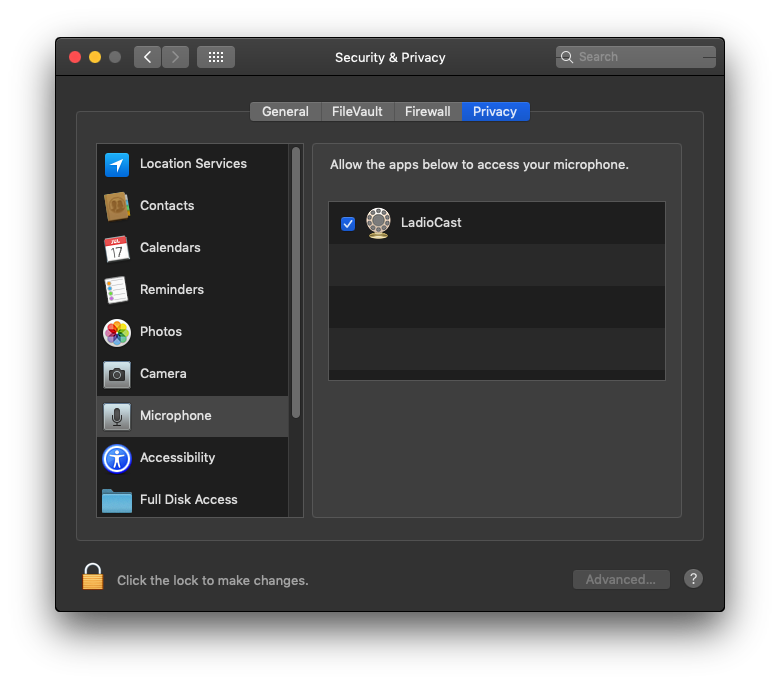 I will make another post after the next LadioCast 0.12.6 passed the apple’s app review and making sure its listing on the privacy section.